If you have followed my blog for a while you may still wonder how Intensive Home Care Nursing services are possible, as Intensive Care is considered the most acute area in a hospital setting and common beliefs are that.lo0 the only way for a Patient to leave Intensive Care is either to go to a normal hospital ward or to pass away in Intensive Care. And here I need to shed more light on my story and on my experience in the field in Germany so that you understand what is possible and that you understand what some long-term ventilated Adults& Children with Tracheostomy and their Families miss out on, because some people haven’t embraced the concept of “INTENSIVE CARE AT HOME nursing services” as yet. When I first left my home country Germany in 2003, where I did my nurse training and worked in ICU and I then entered ICU nursing in the United Kingdom and then later entered ICU nursing in Australia in 2005, I was absolutely shocked to find that long-term ventilated Adults& Children with Tracheostomy and their Families had nowhere to go, but to stay in Intensive Care indefinitely and/or end up with treatment limitations as they had nowhere to go to and to stay in Intensive Care with no Quality of Life and/or no Quality of-end-of-Life. 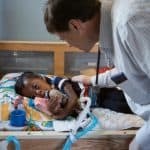 It didn’t seem to occur to the Intensive Care community that these long-term ventilated Adults& Children could be looked after at home with a massive improvement of their Quality of Life and/or their Quality of-end-of-Life, whilst saving costs for the health system, as well as freeing up ICU beds that could be used for other more acutely unwell and very sick Patients. Next on the list of benefits is to improve the Quality of Life for the Families of those long-term ventilated Adults& Children with Tracheostomy who often put their lives on hold, whilst spending days and nights in Intensive Care, neglecting their personal and their professional lives. During my time in Intensive Care in Australia, I have always wondered why the hell most long-term ventilated Adults& Children with Tracheostomy and their Families need to stay in Intensive Care indefinitely with no Quality of Life for the Patients and their Families. I just look at them and think, “Well, I have looked after a similar Patient in the home in Germany”, feeling very sorry for them and their Families. Because I have personally worked as a Critical Care Nurse in Germany providing specialised Intensive Home Care Nursing services for long-term ventilated Adults& Children with Tracheostomy and their Families in Munich, I also see that there is a real need for such services that some people within the ICU community can not see as yet and it is outside of their clinical reality or paradigm as yet. With my experience in the Home Intensive Care nursing service world, I know what is possible for long-term ventilated Adults& Children with Tracheostomy and their Families if they are looked after by Critical Care Nursing staff with the right skill set, but more importantly with the right mindset . Activities such as going to the movies, reintegrating children back to school and just simply putting the Clients and their Families first in their own home outside of a clinical and sterile Intensive Care environment makes such a dramatic difference to their recovery, well being, to their Quality of Life and/or to their Quality of- end- of- Life. Families can focus on living their life as well, rather than spending day and night in Intensive Care. I have worked with a long term ventilated Child that we got back to school on a Monday to Friday basis day in- day out. What a massive difference this made to the Child’s life. The alternative would have been an indefinite stay in ICU. I have also worked with a long- term ventilated Adult with Tracheostomy who we got back to work for 20 hours a week. In both cases this was made possible because we had the right nursing skills and most of all we had the right mindset. We didn’t limit a long-term ventilated Adult or Child with Tracheostomy to the inhibiting and limiting Intensive Care environment, but rather we focused on possibilities and opportunities, whilst also saving money and resources for Hospitals, the Department of Health and for Private Health funds. 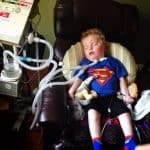 A lot of things are possible in the home and long-term ventilated Adults& Children don’t need all the “backup” and resources available in a clinical environment. It is often an “overkill” and it limits their possibilities and their Quality of Life. More importantly, the risk of catching a hospital acquired infection is simply not there, as a lot of long-term ventilated Adults& Children with Tracheostomy are more likely to catch an infection the longer they stay in ICU, often starting a vicious cycle. 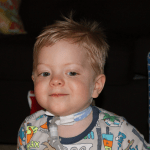 You don’t need a lot of resources to improve the Quality of Life of a long-term ventilated Adult or Child with Tracheostomy, what you need is the right skill set and more importantly the right mindset. 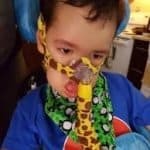 INTENSIVE CARE AT HOME has the right skill set and has the right mindset to improve the Quality of life and/or the Quality of-end-of-Life for long-term ventilated adults& Children with Tracheostomy and their Families in their own home.